Multi-layered Foam is a therapeutic foam mattress that features firm perimeter bolsters, proprietary Heel Slope® with viscoelastic foam, anti-shear surface, multi-tiered core, fluid-repellent cover. Weight capacity up to 400lb, with 7-year warranty. Luxurious, visco-elastic high resiliency "memory" foam in foot section enhances the pressure reducing properties of the Heel Slope feature. Recommended weight capacity: 400 lbs. Note This product does not include Heel Slope feature or Geo-Matt surface. Unique vapor barrier fabric with ultra-low moisture vapor transmission rate (MVTR). Fluid-proof coated nylon is easily cleaned and fully radio-lucent. Exclusive bottom zipper design keeps zipper away from patient. Flap-less construction creates no collection points for contaminants, and allows easier, more thorough cleaning. Flap-less construction creates no collection points for contaminants. Combines with stain-resistant surface coating to ensure easy, thorough cleaning. 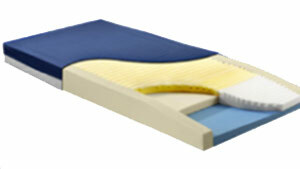 Foam topper is a high density, medical grade foam. The unique geometric design consists of over 800 individual cells, each of which acts individually to redistribute pressure, to reduce heat and moisture buildup on the skin, and to reduce shear to underlying tissues. Two distinct features to protect vulnerable heels, the site of roughly one third of all pressure ulcer. Heel slope reduces pressure on heels with a subtle taper design that redistributes pressure onto the more load-tolerant calves. Foam mattress is placed securely on top of bed frame.